Sharks strand, or beach themselves, with some frequency in certain coastal areas. This phenomenon is seen in other marine creatures as well, and is particularly common in dolphins and small whales. It’s a frustrating occurrence, as the cause for strandings is rarely known, and most stranded animals eventually die. Even in cases where the animal is helped back into the water, it will often strand again. It is usually assumed that stranded animals are sick, or compromised in some way, and have lost their ability to navigate and/or survive at sea, but rarely is the specific cause found. In one of the most interesting investigations of recent strandings, it was found that mass strandings of whales were likely a result of the use of navy sonar devices in the area. Necropsies of the animals found gas bubbles in their tissues. This is indicative of decompression sickness, what divers call the bends, and typically results from surfacing too rapidly from depth. It is believed that the whales may have dived and surfaced rapidly to escape the discomfort of the sonar on their sensitive hearing. These data led to regulations on sonar use when conducted in areas that whales frequent. In other cases, mass strandings are thought to be a result of poisoning by the toxic algal blooms known as red tides. In a recent paper by Schaff et al, another potential cause of stranding is identified. 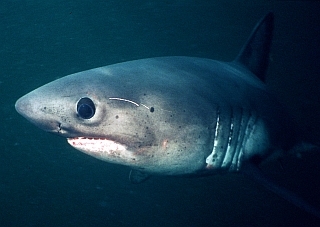 The authors observed that significant numbers of juvenile salmon sharks (Lamna ditropis) strand along the northern California and Oregon coasts each year. They collected and necropsied 18 salmon sharks, both fresh and preserved carcasses, that stranded and died between 2002 and 2007. Upon initial observation they observed that the meninges, the membranous coverings of the brain, showed signs of inflammation. Various regions of the brain itself also had many inflammatory immune cells, typically a response to some sort of infectious agent, and in some cases abscesses filled with bacteria were seen. When the shark’s livers were available for analysis these also showed signs of severe infection. In many of these sharks the bacteria could be cultured, and were then subjected to DNA analysis to identify the species. The authors sequenced the 16S ribosomal RNA gene of the isolated bacteria, a region of the genome commonly used to identify bacterial species. This analysis showed the bacteria to be a Carnobacterium, likely the species Carnobacterium maltaromaticum. This is a common bacteria in various marine creatures, though it had not previously been found in sharks. In fish, it typically causes no pathology to its host, but in some cases may result in sickness and death. The bacterium was not seen in any of the control sharks analyzed in this study. Interestingly, all the bacteria isolated from the different sharks (which stranded in different coastal areas) were genetically identical, without even the small genetic differences expected of separate bacterial isolates. This suggests there may be a single source from which all sharks acquire the bacteria. Meningitis has occasionally been found in stranded sharks before, but its role in the strandings was unclear. The nearly 100% incidence of this disease in the stranded juvenile salmon sharks provides compelling evidence that this is likely to be the cause of the stranding. Meningitis can cause disorientation and confusion, which might lead the sharks to strand inadvertently. Identifying the source of this bacteria, and understanding why it appears specific to juvenile salmon sharks, may help to prevent loss of these animals in the future. The article is: Schaffer, PA, Lifland, B, Van Sommeran, S, Casper, DR, and CR Davis. (2012) Meningoencephalitis associated with Carnobacterium maltaromaticum–like bacteria in stranded juvenile salmon sharks (Lamna ditropis), Veterinary Pathology (online before print).